With the game's release date just a few days away, a major advertising campaign has commenced with 40 different characters appearing on digital sign boards in JR train stations across the Kanto region. The signs will be on display between 20th and 26th July 2015. The article has a list of all nineteen major stations which will be displaying the signs for the benefit of fans who want to visit and track down their favourite characters. The ongoing tie-in campaign between the Sengoku Basara series and the New Japan Pro-Wrestling group (NJPW) has taken things to the next level with the announcement of a wrestling costume designed by the Sengoku Basara team. 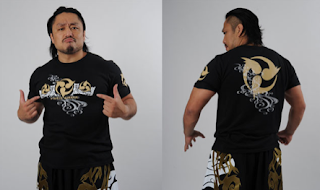 Wrestler Gotou Hirooki will be wearing the outfit for the G1 CLIMAX tournament starting on 20th July 2015. KobaP and Gotou met up to promote the new collaboration at a press event, where it was revealed that Gotou found the Sengoku Basara games a refreshing way to release stress. 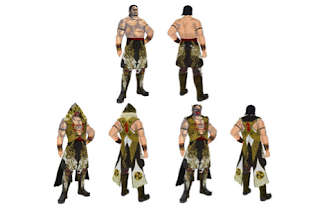 He was very surprised to discover that the series was particularly popular with female gamers. 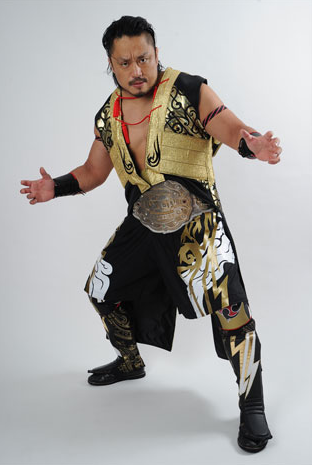 At one point they let Gotou try out Sengoku Basara 4 Sumeragi during the event. Since he was already familiar with the series, he cleared a few stages as Masamune and admitted that he lost track of time when he was playing. He was then allowed to try the same stage again on the new 'Heaven' difficulty. After struggling through the tough enemies for a while, he eventually had a game over, saying that while the enemies were a bit too strong it made killing them all the more fun. Going back to the costume design, the Japanese-style clouds and lightning imagery are intended to fit with Gotou's 'daredevil' nickname and he's apparently looking forward to trying it out in an actual match. A 'Thunder God' t-shirt inspired by Gotou Hirooki and designed by the Sengoku Basara team will be available from 20th July 2015 costing ¥3,000. 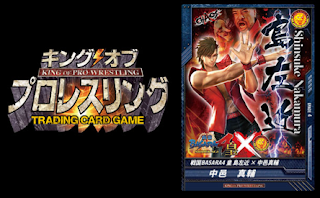 In addition, a special card featuring Shima Sakon dressed as Nakamura Shinsuke will be released for Bushiroad's Sengoku Basara x King of Pro Wrestling card game. The card will be randomly packed in boxes of the fourteenth series of the game, from 10th July 2015. As part of the Sengoku Basara tenth anniversary celebrations, it's been announced that the series will team up with Nikko Edomura for a special commemorative event between 23rd July and 12th October 2015. Nikko Edomura (Edo Wonderland) is an open air historical museum set up to recreate the atmosphere of what it was like to live in the Edo period. I happen to have been there twice before, and while it honestly has very little to do with the warriors of the Sengoku period it's an amazing place to visit for anyone with even the slightest interest in Japanese history. You're encouraged to dress up in traditional clothing upon arrival and wander the streets, sampling old fashioned food, talking to staff members (who dress and act in character) and learning about history in a fun way. There are live action ninja shows, traditional games, magicians, courtesan performances and ninja weaponry exhibitions; in short, it's a history fan's dream come true. A variety of attractions have been announced to tempt Sengoku Basara fans into making the trip to Nikko. 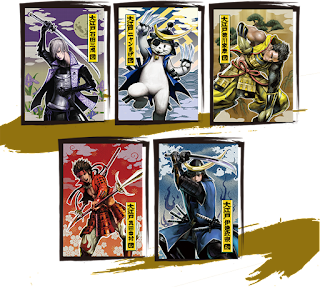 Ashikaga Yoshiteru's archery range will be offering a tenth anniversary clear file, and visitors can participate in a treasure hunt to win one of five exclusive Edo Wonderland character cards. One of them has the park's mascot Nyan-mage dressed up as Masamune. 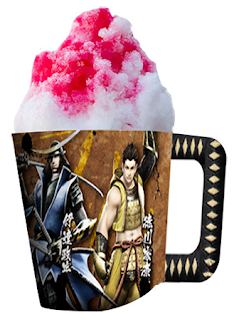 Special Sengoku Basara merchandise and menu items will also be available for visitors to the park, such as character-themed shaved ice, and characters such as Sen No Rikyuu, Ashikaga Yoshiteru and Kyougoku Maria will also be appearing around the village. I'd definitely go again to check out this collaboration if I was able to get there! The Butai Sengoku Basara vs Devil May Cry stage play will start its run soon and Famitsu has posted an article full of pictures of Yamaguchi Daichi and Matsumura Ryuunosuke, the actors who will be playing Date Masamune and Sanada Yukimura respectively. The pair also shared a few thoughts on the unique challenges of acting in a crossover play. 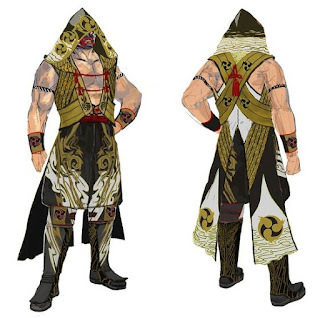 The official website for the new game and anniversary celebrations have also been updated with some design improvements, and Sengoku Basara 4 Sumeragi has officially entered the Weekly Famitsu gold hall of fame after achieving a score of 34/40 in this week's cross review. This reminded me that I completely forgot to summarise the reviews when the magazine came out (oops) so let's fix that. The four reviewers all mentioned the game in their 'best of the week' recommendations at the end of the review pages. The total score is one point lower than the 35/40 which Sengoku Basara 4 received but as three of the four reviewers are different people to before it's up to you to decide how relevant that fact actually is. I'm pretty happy with the result! The tenth issue of Sengoku Basara Magazine can now be preordered on Amazon Japan, so it should be available at all good online import bookstores soon. The release date is listed as 31st August 2015 which means there're keeping to the original publication schedule even though the previous issue was a month late. 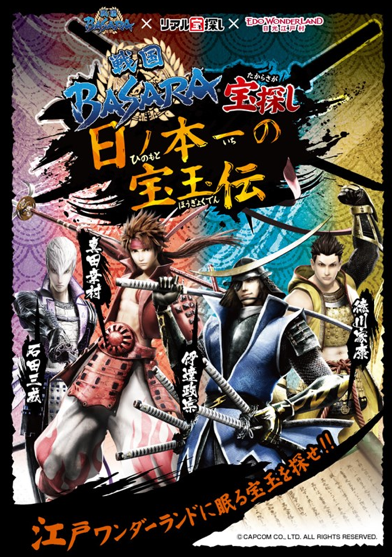 Today's new Sengoku Basara 4 Sumeragi video clip is (Approximately) 10-second Theatre: Creature Concerto, a preview of the new animal-themed one-on-one battle. Just wait, soon Ieyasu will get that wrestler's yellow hoodie outfit as another DLC. Thanks for the post about the save data. I was thinking it reminded me a little of a smarter-dressed Kanbee but... you're going to be right, aren't you? That hood will be too tempting for the designers! Haha, they mean the PS3/PS4 editions of Sengoku Basara 4 Sumeragi are very similar, that's all. Good news for PS3 users! Btw, what is this new Play Book?